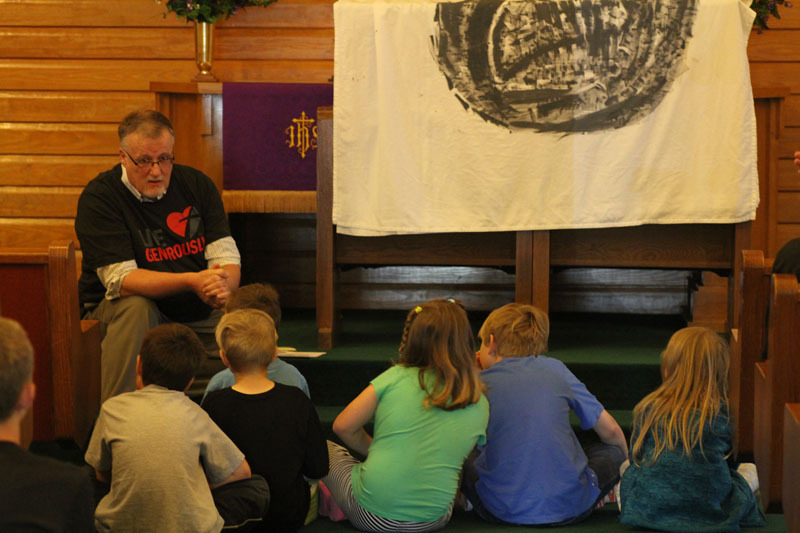 On Saturday, March 28, we held our Easter for Kids program based on the “Jesus Rises From the Dead” program published by Northwestern Publishing House. We had so many volunteers help put this program together behind the scenes and on the day, that it seemed like the whole morning went smoothly! I had fun, and I think the children had fun, too! First, we opened with a short devotion led by Pastor Schmidt. He talked about how the stores often had things in bright pastel colors, like Easter eggs and baskets and chicks, but the real story of Easter was all about Jesus and how he died to save us from our sins. 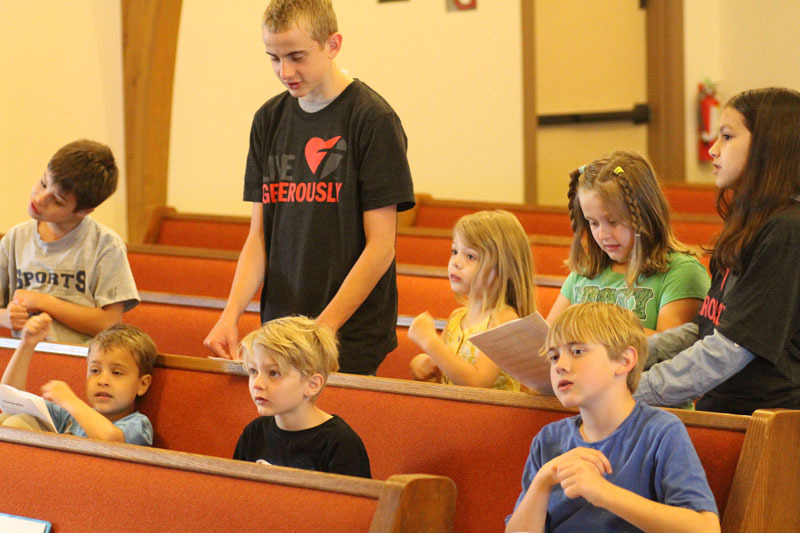 Pastor Schmidt leads the children in a short devotion. After the devotion, we had a small skit where the stone that covered Jesus’ tomb told us all about what happened on the day Jesus was resurrected since the stone was there (and we were not). 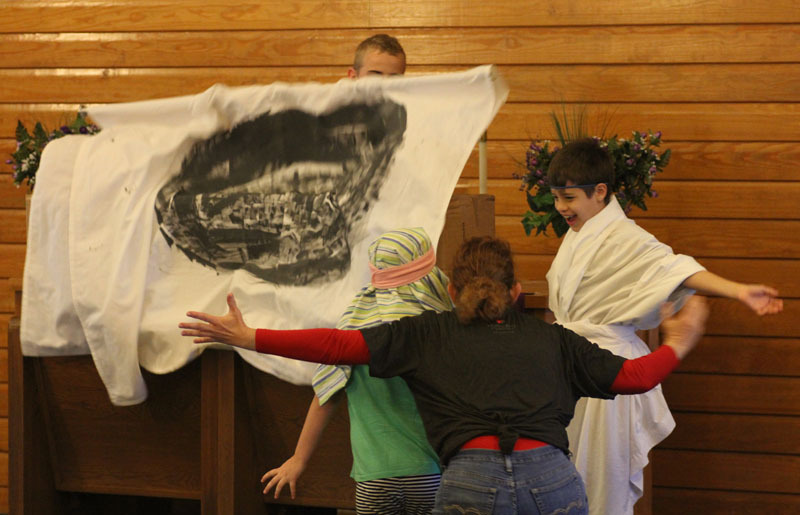 Some of the children were very excited to get to play a part as one of the mourning women and the angel in the skit. Next the children made some yummy snacks! I wish my photos had turned out better, so you will just have to take my word for it on how scrumptious they were. The snacks reinforced the empty tomb we had just been talking about. The children sprinkled sugar on a triangle of crescent roll dough, then wrapped it around a marshmallow. Later, after baking, the marshmallow had disappeared! The “tomb” was empty! After the rolls were done baking, we also enjoyed some cupcakes with half a chocolate-covered marshmallow egg on top (another empty tomb! ), and some lovely fruits and vegetables provided by one of our members. 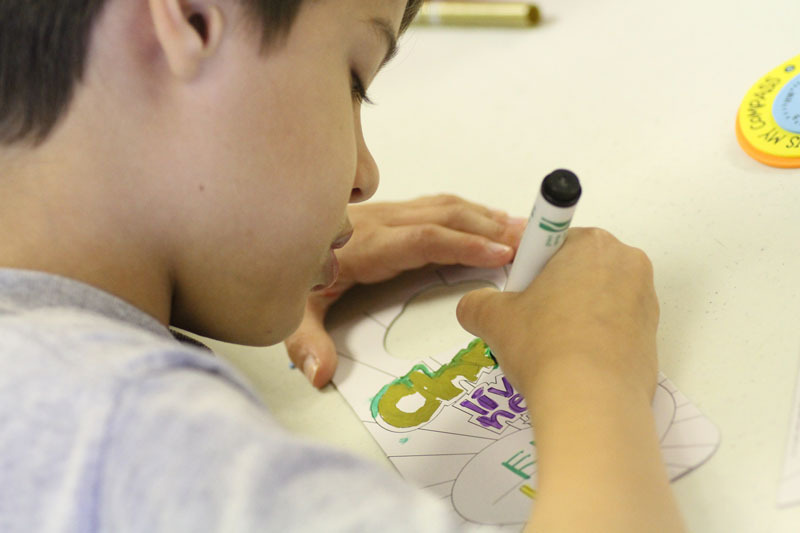 The children had fun making bright, colorful crafts, too. 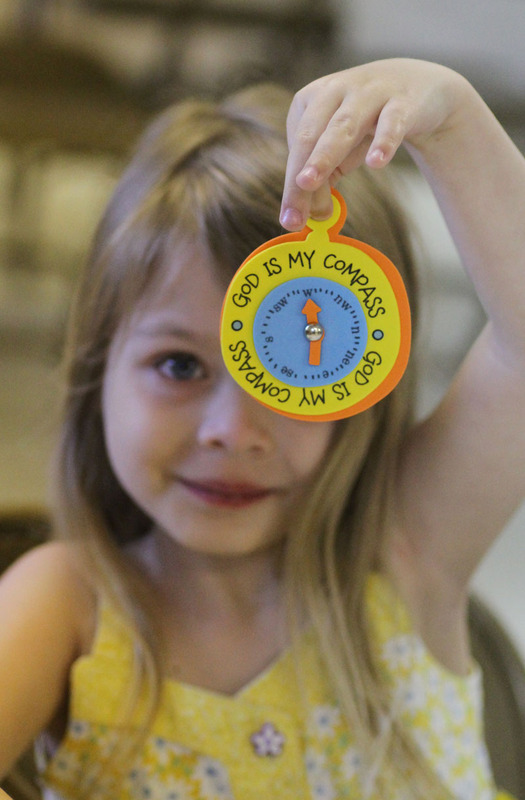 Compasses, door hangers, etched bookmarks, and more all reminded them that Jesus loves us and guides us on our paths! The children enjoyed making crafts reminding them God points them in the right direction! After the lesson, we sent the children outside to play games. 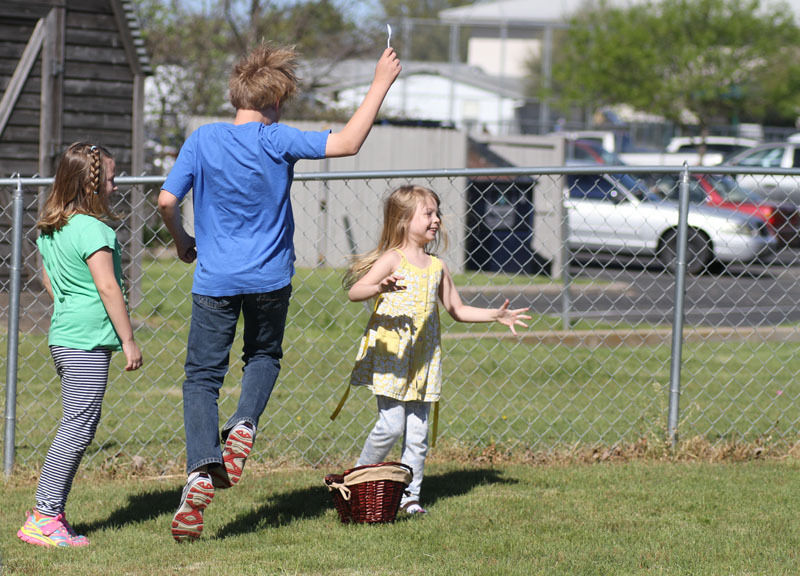 While we did have a couple of Bible-themed games, the one they seemed to enjoy the most was the egg relay. 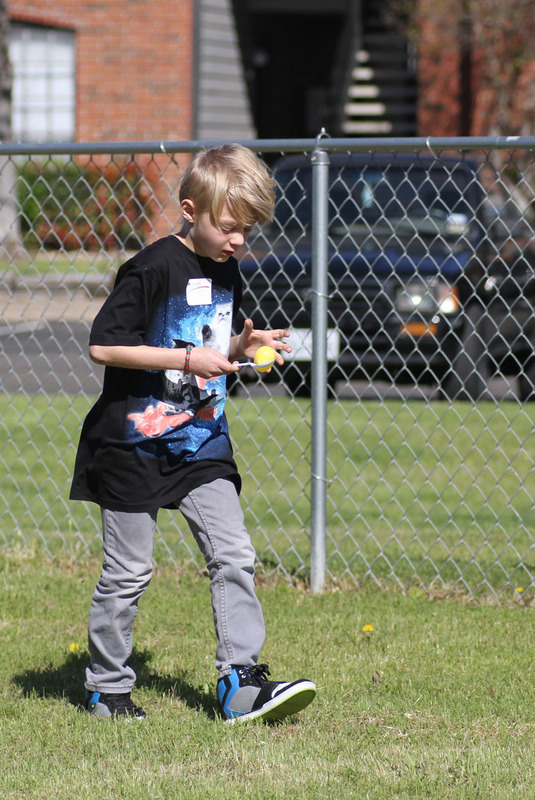 The children had to balance a plastic egg on a spoon, run it the length of the playground, and put it in the egg carton. Some of the children were very careful, and others just zoomed right across the yard. It was highly entertaining to watch! We even had a couple of children join us from the neighboring community near the end of the games, which was just lovely. They stayed to join us for the closing devotion as well. Slow and steady keeps the egg on the spoon. The winning team! They were a little excited. Finally, we sent them in for songs and the closing devotion. We had such a wonderful time watching the children learn about Jesus and the wonderful things he did for us! If you ever have the opportunity to serve in one of our Vacation Bible School outreach programs, please take the time to do so. I also want to give a big, giant thank you to all the wonderful people who put so much time and energy into making this a great program for our kids, as well as to the people who donated items to make it such a great day for them as well. We couldn’t have done it without you! Finally, I also want to give a thank you to Thrivent, who gave us a financial donation to purchase some of the things we needed for this and the next VBS program. Praise God for providing what we needed, not just the physical things, but also the lessons we learned, and the open hearts of the volunteers and the children to receive them! This was a very nice morning! I’m looking forward to the next one.